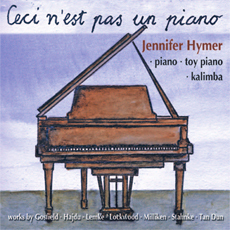 The compilation of compositions for this CD „Ceci n’est pas un piano“ was inspired by a piece of the same title that Annea Lockwood wrote for me in 2002. This is a piece in which a video collage of Lockwood’s „Piano Transplants“ (a series of pianos which were burned, buried and drowned)* plays behind the grand piano during the performance. Like her piece, the program probes the piano’s identity by testing the boundaries of what this trusted instrument – as well as the pianist - can or should do. The collection attempts to question, contradict and confirm that the piano is indeed a piano; whether it’s the through the non-traditional use of the piano with its transformation into an exotic string instrument in Tan Dun’s “C-A-G-E”, Annie Gosfield’s humorous use of the piano as a quasi-baseball stadium or Georg Hajdu’s in and outing of the piano keyboard and its interior. Or the consideration of other instruments besides the grand piano such as the thumb piano - or Kalimba - in Sascha Lino Lemke’s „KalimBAO“, and the toy piano - a smaller, less-developed sibling of the regal original – in Manfred Stahnke’s humorous portrayal of his bike ride from home to work. With Cathy Milliken’s “Objects”, questions of identity are doubly at work through a narrator/actress part appropriated to the pianist as she verbally and musically explores the essence of yet another array of objects picked from the poems of Getrude Stein, William Carlos and e.e. cummings. Ceci n’est pas un piano? Questioning often confirms as much as confirmation needs questions and in my eyes, the endless possibilities of a piano program only reinstate the piano as a tried and trusted friend; it being an anchor that gives basis and inspiration for new and yet unimagined adventures.